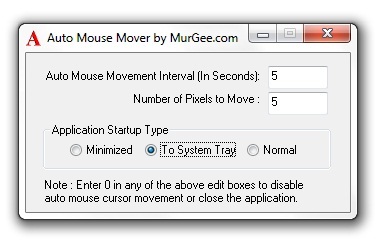 Auto Mouse Mover utility allows you to move the mouse cursor continously at a configurable interval. The Mouse Utility can be useful to keep your computer in active state and in turn prohibiting the operating system to launch the screensaver. Auto Mouse Mover provides continuous mouse movement input to the computer, there by disabling the configured idle actions temporarily, without actually disabling them from control panel. The Configured idle actions can be launching a defined screensaver, send computer into hibernate mode or sleep mode etc. Auto Mouse Mover is a a sort of Human Device Interface systems where device here is the mouse cursor and insread of human interface, the mouse utility keeps on moving mouse at configurable interval at for configurable distance in pixels. Disabling the automatic mouse movement is as easy as starting the automatic mouse movements. The Mouse utility can also be configured to be minimized at the startup, so that you can launch it easily and quickly. Download the free auto mouse movement utility and get control of your computer's inactive / idle actions. FcronQ is an Fcron GUI for Linux. Fcron is an advanced periodical command scheduler, which aims to replace its predecessors. It was designed by Thibault Godouet. This software can record all the clicks and typing that you do on your computer and then replay it for you which means it will do every action that you did on your computer again. Save time and automate your PC. Record macros and build scripts with the powerful, easy to use scripting language. Assign macros to schedules, hotkeys or desktop shortcuts, or compile to standalone EXEs. Automate those mundane, repetitive tasks. JitBit Macro Recorder LITE is a simple and low cost keyboard recorder, mouse movement recorder, player and editor. All recorded keystrokes and mouse activity can be saved to disk as a macro, bound to hotkeys and more. Most powerful batch files editor in the world. Want to create batch file? Just install it! Designed both for users that have never created BAT files before and for those who know their syntax well. Included bat to exe compiler, Backup Script Wizard. With Batchrun you can create a batch file using a graphical interface. You can launch multiple Windows apps with a click. Start Batchrun, add the applications you would like to run together or one after another, then select "File | Save to Desktop". WinLpt is a handy 12 LPT port pins manager. The program allows to control the output LPT port manually or automatically in strict accordance with the commands script. Music Visualization for 8 or 12 LEDs is available (Winamp, WMP, AIMP2). Delete/Filter lines from big text files (for example log files). Thereby you can also use regular expressions, if required. Additionally it is possible to delete not only the found line, but also any number of lines before and after it. Sends personalized emails. Merge two lists of email addresses,Subtracts two lists, example: subscribers - customers,Intersects two lists Remove duplicated emails with different names inside a list,Split a large list for massive delivery,etc. This site does not contain serial number, crack, keygen Auto Mouse Mover serial number : serial number is the simplest type of crack. A serial number(cdkey,product key,etc) is register the program as you may already know. a crack or keygen may contain harmful software. If you cannot find the exact version you want, just give it a try. for more information read .nfo/.txt/.diz file include in zipped file.